A popular debate in the 18th-century was whether America would equal or surpass Europe in the arts and sciences. Thomas Jefferson, while ambassador to France, responded directly to the speculation about the scientific credibility of the young nation by publishing a detailed account of the natural history of Virginia. His work provided evidence of the accomplishments of scientists in the New World. This installation displays the influential contemporaries and pioneers who contributed to the credibility of early American science. Despite varied backgrounds and professions, many subjects in this installation were friends and were members of the American Philosophical Society. Their contributions were as diverse as their professions and range from the assembly of a mastodon skeleton by Charles Willson Peale to John Ewing’s contributions on astronomy in the first edition of the Encyclopedia Britannica. Americans were proud to point to Benjamin Franklin’s discoveries in electricity, Ewing’s publications on astronomy and his proposal for David Rittenhouse to measure the transit of Venus and John Jeffries’ balloon flight and meteorological observations. All served to support the pride that Americans felt at the time and proved the New World deserved recognition for scientific achievement. From October to early March, the Portrait Gallery will also display the redesigned $100 note that will be in circulation on Oct. 8. Franklin’s likeness on the note is based on the portrait in the museum’s collection by Joseph Duplessis. 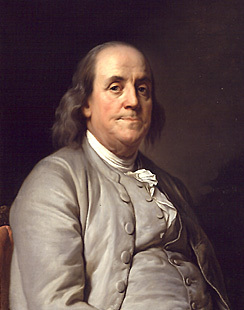 In addition to his scientific achievements, Franklin had been a printer and designed paper currency for the early Republic. He developed anti-counterfeiting techniques like adding a leaf to the printing plate, which made it difficult to reproduce the paper notes.